This portrait of museum founder Norton Simon was made by Los Angeles-based artist Don Bachardy, best known for probing portrayals of actors and artists that he completes in a single sitting. The commission for this drawing came about through Mr. Simon’s wife, Jennifer Jones, a long-time friend of Bachardy and his partner Christopher Isherwood. As the artist recalled many years later, Jones agreed to sit for Bachardy on the condition that he depict her husband as well. 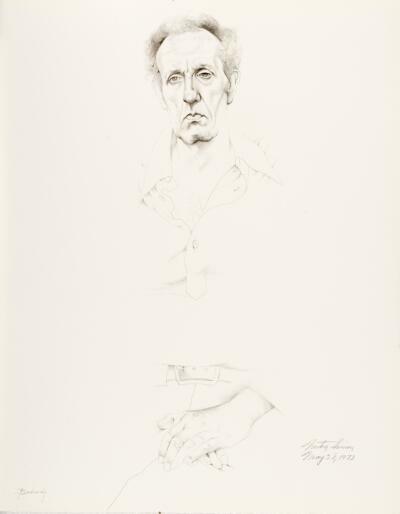 Mr. Simon dutifully posed for two drawings on May 28, 1973, which he signed and dated himself, as was Bachardy’s custom. After the sittings, however, Ms. Jones “laughingly reneged” on her agreement, and she never did acquiesce to pose for Bachardy herself. The drawings of Simon chronicle the first and only time that the famed collector sat for a portrait, and they depict their subject as watchful but relaxed, offering some sense of the interest and attention that he directed to works of art. Norton Simon was a patron of the arts for more than forty years. But this is the only known portrait of him. Don Bachardy captured Simon in his mid-sixties, with elegant lines and a masterful rendering of hair, flesh and fabric. Bachardy—renowned for his portraits of major figures in film, literature and the arts—remembers how Norton Simon’s wife, Jennifer, persuaded him to paint her husband. [Norton] was actually a very good sitter. He sat very still, he didn't make any difficulties. There was no resistance to being inspected by me. Bachardy made two portraits of Simon. Bachardy, who knew the Simons personally, was a frequent visitor to their house in Malibu, where Norton Simon discussed his collecting. You can see many of the paintings that Bachardy first viewed in the Simon’s Malibu home today, in this museum.